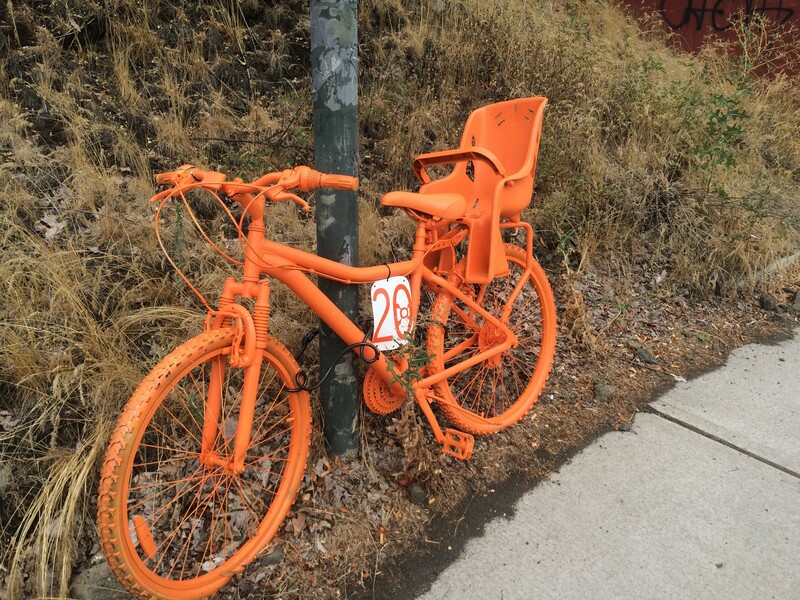 If you've seen any of the 20 bright orange bikes chained to light posts in the South Hill neighborhood and thought you missed the news of a massive cycling accident, you're not alone. Rest assured there was no accident. No one was injured. The orange bikes are not memorials for cyclists, known worldwide as ghost bikes; rather, they are promotional advertisements for a new fitness center opening this fall. Phil Larkin, a local bike commuter, started noticing the bikes on his way to work. "At first I thought 'Wow, someone died here,'" he says. "Then I started seeing them around town and thought some organization was trying to promote bike safety." Then Larkin saw the bike at Southeast and 29th Street with a baby seat on the back, and he took to Facebook to try and find out what happened. Richard Cote, who was involved in the promotional advertisement idea for the new fitness center Orangetheory Fitness says they had no intention of offending anyone. The new gym had planned a Facebook competition that involved members taking selfies with the bikes to win prizes. "There was no intention to mock the ghost bike phenomenon," Cote says, after becoming aware of the disapproval of some in the bike community via social media. All of the bikes had been removed as of Monday afternoon (but not before an Inlander reporter snapped a few pictures). Cote says he and some other employees took the idea from other Orangetheory Fitness locations in Seattle, but decided to take the bikes down after the backlash on social media and a discussion with a code enforcement officer for the City of Spokane. Heather Trautman, the director of Neighborhood Services and Code Enforcement for the city, says off-site signs advertising businesses are typically not allowed under the city's municipal code, except in cases like a grand opening or special event. Neither does the code allow for any objects to be chained to city infrastructure such as light posts or traffic signals — promotional or otherwise. That means ghost bike memorials are not allowed either. The ghost bike movement started in St. Louis, Missouri, when volunteers placed 20 white bicycles around the city, marking places where cyclists were injured or killed by cars. So it's easy to see why Larkin and others were confused by the promotional stunt. The movement now includes more than 630 ghost bikes in more than 210 locations worldwide, but the most recent count is from 2012, so those numbers are likely much higher now. A ghost bike appears in Spokane. Leaders ponder the next move.